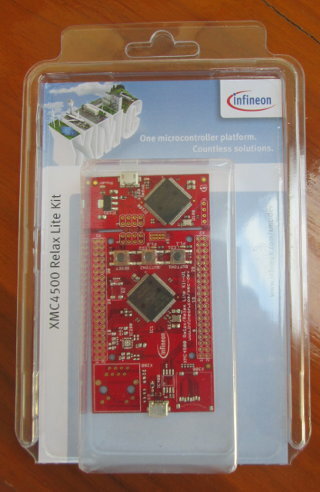 Infineon Relax Lite Kit is a 10 Euros development kit based on Infineon XMC4500 Cortex M4 MCU with 160 KB SRAM and 1 MB flash, and featuring 2 USB OTG ports for debugging and powering up the board, 3 buttons (including reset), 2 LEDs, and 2 headers (through holes) giving access to the signals from the MCU such SPI, I2C, I2S, UART, CAN, ADC, DAC and PMW. The kit if available online via Hitec, but unless you live in Germany, this is not an interesting option, as international shipping costs over 100 Euros. So you’d better check local distributors in your country. The package only comes with the board, and you’ll need a USB to microUSB to power the board. To get started, simply connect the board via the USB cable to one of the USB OTG connectors, and to a Windows PC. The power LED (green) should lit up, the debug LED blink quickly, and the factory default program will blink a red LED (LED2). You can then turn on/off LED 1 and 2 with the respective buttons (BUTTON 1 & 2). To really get started with development, you’ll need to visit http://www.infineon.com/xmc-dev, download the user manuals and install DAVE 3 toolchain. But first let’s have a a closer look at the board itself. The board is composed of 2 parts: the MCU board (right) and the on-board debugger by SEGGER (left). The on-board debugger is detachable, by pressing the board. I haven’t tried to detach it though. You can notice places for unsoldered components on the MCU board, this is for Ethernet, microSD socket, RTC, and QSPI flash on the XMC4500 Relax Kit. download DAVE 3 (I chose DAVE 3.1.4 installer package: DAVE-3_1_4_Installer-2012-11-5.zip), and install both DAVE 3.1.4 and SEGGER-JLink ARM v4.56. In Dave Site section, click on Library Update sites. Go to General->Network Connection, and select Direct for Active Provider. I had to do this or I was unable to connect to infineon site to download the apps and libs below. Still in Library Update sites window, go to Dave->Library Manager->Library Update Sites and validate both entries: http://dave.infineon.com/Libraries/DAVEApps/XMC4500/v3.1/ and http://dave.infineon.com/Libraries/Examples/XMC4000/, and click OK. Select both, click Next, accept the terms, and click Finish to complete the download and installation of the libraries. To install apps, select DAVE Project Library Manager in Work With menu, and follow the same procedure as in step 5. You may want to only select the sample apps you want. I selected all of them (Around 60), and it took over 2 hours to download and import. There are all sorts of demo apps from simple apps showing how to use peripherals (LED, UART, PWM, I2C, etc..) to more complex apps such as webserver and motor control apps. Let’s take something easy with an app that controls LEDs and buttons. Right click on LEDTS001_Example1 in C/C++ Projects window on the right, and select Set Active Project. Click on Project->Build Active Project in the top menu to build the sample app. The build output is shown in the console window at the bottom of the IDE. Upon successful build, click on Debug->Debug or type F11 to start running on debugging the program on the platform. You can switch between TASKING Debug and other views such as DAVE CE and DAVE IDE by clicking on “>>” at the top right of the IDE. The system will load the app and break at the main. To run the application, click on Debug->Resume. That’s it, the program you’ve just build now runs on the devkit. DAVE 3 also does not like bad network connection and incorrect settings, so if those happen it may just hang there, and the Cancel button is virtually useless. DAVE 3.1.4 is a beta version which may explain it. But apart from those few shortcomings, DAVE 3 IDE appears to be a decent development IDE with lots of features, and the App Store for XMC4500 Relax Kit (lite) could also be an asset when learning about the platform, as long as available apps work.